Lechon Kawali is cooked by boiling and deep frying the pork in a pan. This is also called as pan-roasted pork or crispy pork belly. Some of you might get confused because there's this very famous food in the Philippines, which is also the national dish, called Lechon. It is cooked in a pit that is full of flamed charcoal. I really love this dish. Although it is very high in cholesterol, it is just irresistible. Once you eat it, you'll surely ask for more. For the sauce, you can use vinegar with soy sauce, onion and garlic. 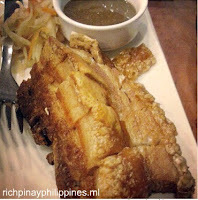 Others prefer using this famous lechon sauce, called Mang Tomas. 1. Boil water with salt, garlic, peppercorn, and soda. Add pork and continue boiling until meat is tender. Strain pork and let it cool down for a few minutes. 2. Spread 1 tbsp of salt on the meat, make sure to distribute it evenly on all sections. You can also use All-in-one seasoning granules. 3. Deep fry in hot cooking oil until golden brown and crispy. 4. Chop the lechon kawali. Serve it with lechon sauce or vinegar with soy sauce, garlic and onion.